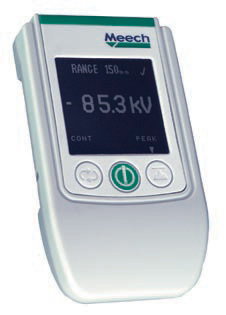 The Model 983v2 Static Locator provides accurate measurement of electrostatic charges. Its design enables fast response, low drift and ease of operation. The 983v2 can operate in “Continuous” or “Peak Hold” mode to record changes in the level of charge or the highest charge detected respectively. The Model 983v2 is suitable for use by production, maintenance, inspection and quality engineers and on any material where static charge may be an issue. The Model 212v2 Benchtop Ioniser is a compact unit that provides excellent work station coverage and a high level of ESD protection. Balance ionisation (typical) +/- 10V - Prevents possible ESD damage in sensitive electronic applications, reduces scrapand saves on replacement costs. Dirty pin indicator and audible alarm - Particularly important in applications where balanced ionisation is key to prevention of ESD damage to components. Also, informs the operator when maintenance is required (emitter pin cleaning). Removable pins - Easy to clean and replace. Minimum maintenance downtime. 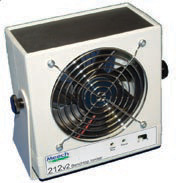 Two fan speed settings - Can be set for optimum operator comfort and ionisation range. Small footprint - Takes up little room, allowing more space for operators' work activity.